With Easter and the temptation to consume your own body weight in chocolate out of the way, are you ready to show off that winterised body? After hiding under chunky sweaters and fleece leggings for the past few months, your body might not be eager to leave the comfy realms of winter hibernation. Don’t worry, it’s the perfect time to think of some options to dress-ready your body and enjoy smooth, hair-free arms and legs. At Epilium & Skin, all our beauty treatments incorporate the latest advanced technology. Instead of waxing, we offer long lasting and permanent hair-free solution such as laser hair removal: the essential treatment to get you spring ready! Laser hair removal is an aesthetic medical procedure which brings you a permanent reduction of hair and delivers excellent results for many areas of the body. At Epilium & Skin we are able to use higher settings than most places in London. Our lasers are controlled by our doctors, which allows us to deliver better results in fewer sessions. Whatever your skin type may be; white, olive or dark, and regardless of the area you want to treat, our aesthetic practitioners conduct a full skin examination and recommend a personalised treatment program. 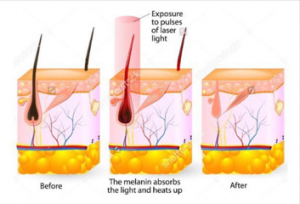 No matter how dark your skin is, we are able to match the right laser to your skin type and avoid the risk of burns, thanks to our expertise and technical resources. At Epilium & Skin HQ, we are pleased to introduce our Wellness coach consultant: Aldona Gidzinska. Aldona specialises in balanced holistic therapy, nutrition and exercise together with building a healthy lifestyle for her patients, around daily routines, personal coaching. Aldona helps each individual to discover their inner and outer beauty. Summer will be here in no time; thus, it is now or never to work off that Easter chocolate and start getting your summer body ready. Aldona and Epilium & Skin have teamed up to create exclusive body packages that will help you achieve the body you deserve for the bikini season. Packages include Wellness coaching sessions and Coolsculpting treatments to redefine your silhouette and lose persistent areas of fat. Coolsculpting is a non-invasive procedure that crystallises fat cells. The cells are eliminated naturally by your body after being given this thermal (cold) shock. Getting in shape should be a pleasant experience!